TrueConf team is happy to announce TrueConf Weathervane 1.0, a software solution for large conference & meeting rooms. TrueConf WeatherVane easily integrates with hardware discussion systems and software video conferencing endpoints to automatically track speakers using multiple PTZ cameras. Several months ago we introduced TrueConf Tracker, a room solution for automatic speaker tracking in small to middle meeting rooms. 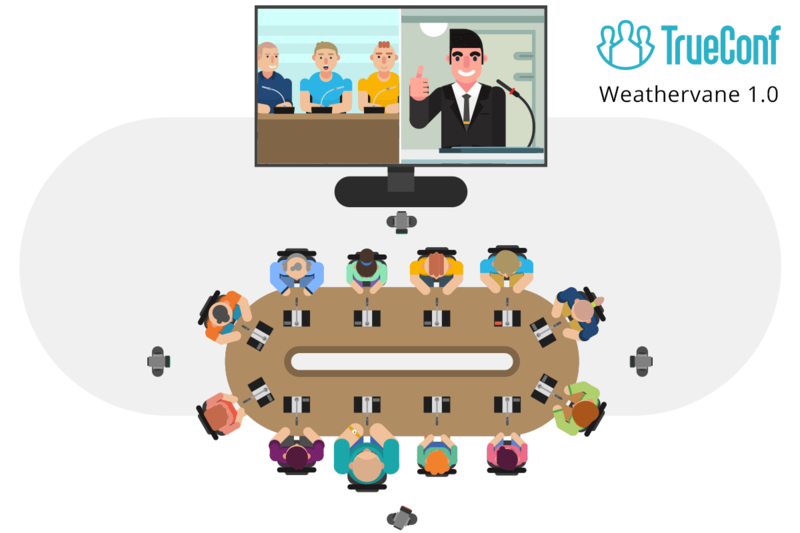 Today we are launching TrueConf Weathervane 1.0, a tracking solution for large meeting rooms. TrueConf Weathervane kicks in when one PTZ camera is simply not enough. To frame speakers and direct a suitable camera, legacy hardware control systems are normally used. However, such room setting requires additional integration services and some customization. To solve this classic AV problem, TrueConf team has come up with TrueConf Weathervane, a modern IT solution which allows you to avoid additional integration costs and declutter your meeting room. Our new solution supports three types of connection: discussion system control unit, cameras over UVC и VISCA) and HTTP protocol with TrueConf Terminal API (used to switch active cameras). TrueConf Weathervane is designed for use with free PC software for rooms – TrueConf Terminal. We are currently working on the extension of compatible discussion systems. If you’d like to give TrueConf Weathervane a try, just contact us!